To prove the black-and-white Nissan Cube isn't the only EV they're cooking up on the B-platform, Nissan's released one grainy image of a Nissan Tiida in electrified form. That's the Versa to us US buyers. Jut in case you aren't too stoked at the idea of hopping into an EV Cube with your enviro-bros and hitting the wheat grass bar to talk about how evil corporations are, Nissan is developing other offerings on the B-platform beside the asymmetrical square prism. The Tiida is the Versa in the US, and rides on the same platform as the Cube, meaning electrification isn't a terribly complex task, this particular image of a test car, though on the low-resolution side, proves the point. So instead of hipster-chic you get bland and goofy geek. Happy EV buying. The in-house developed electric motor delivers 80kW/280Nm for high response and powerful acceleration. Nissan's unique motor control also contributes to the vehicle's seamless acceleration. The 24kWh laminated compact lithium-ion battery pack is placed under the vehicle floor for more efficient packaging, without compromising cabin or cargo space. The battery layout also allows smooth underfloor air-flow which helps reduce drag. Additionally, the regenerative brake system employed to recharge the battery during deceleration and braking extends the driving range to more than 160km*1 under a full charge. High durability is achieved by employing an additional frame for the battery pack to significantly improve the rigidity of the platform. The combination of a high rigidity platform and electric powertrain minimises vibration and external sounds to produce a quiet and pleasing drive. Nissan has developed a sophisticated IT system for its zero-emission EVs, connecting the vehicle's on-board transmitting unit to a global data centre*2 to support EV driving 24 hours 7 days a week. * With a simple touch of a button, the navigation map shows the driving radius within range under the current state of charge. * The system can calculate if the vehicle is within range of a pre-set destination. * The navigation system points out the latest information on available charging stations within the current driving range. * Detailed information for each charging station will also be displayed. * The timer function enables the air-conditioner or battery charging to begin at a specified time. The air-conditioner can be pre-set while the vehicle is plugged-in to cool the cabin to a desirable temperature before driving begins, without taxing the vehicle's battery. Meanwhile, the battery charging can be set to start at a specified time at night to benefit from more favourable electricity rates. 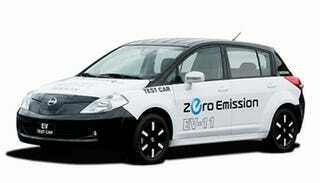 * The driver can monitor the state-of-charge of the EV via an online website and a cellular phone. For example, when the battery is fully charged, a message alert is sent to the cellular phone. Additional remote control functions range from switching the charging system ON/OFF or setting the air-conditioner timer. To be a leader in zero-emission mobility, Nissan is progressing its development for electric vehicles and the key components. The all-electric vehicle slated for launch in 2010 will have a unique design and body. Nissan plans to unveil the design of the production EV at its new Global Headquarters Opening in Yokohama on August 2nd. A Nissan Zero-emission Website (www.nissan-zeroemission.com) will also go live on Aug. 2nd. Nissan has been addressing a wide range of actions under "Blue Citizenship" which represents the company's desire to protect the blue planet and to be a corporate citizen that can live symbiotically with people and society. These efforts range from such global issues as the environmental protection to contribution to communities, promoting diversity and making personal mobility available to as many people as possible. Nissan continues promoting the development of zero-emission vehicles based on the "Blue Citizenship" spirit by introducing effective technologies, products and services into the market. *1: US LA4 mode. Actual range may vary depending on driving style and conditions. *2: Global data centre: A globally common platform to provide identical telematics services via mobile network by connecting internet and vehicle IT system.